Good friends (Laura, Bobby, Traci, and Fred) on a special day. 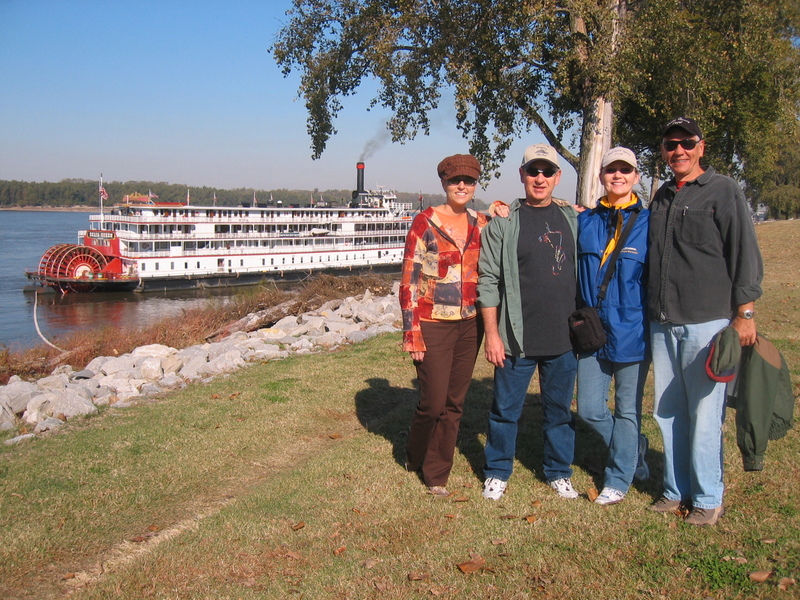 We arrived into Memphis early on the 30th for on a lovely autumn day. Due to the low water, we could not dock in the harbor at Mud Island but instead moved up to the alternate landing a couple miles upstream at the beautiful Greenbelt Park that extends along the riverfront. Before the media began to arrive for the event, Laura and I joined a few friends for a walk through the park down towards town. We crossed into town and caught the trolley just for fun down to Union. The Peabody Place mall is being converted into hotel suites, but Starbucks was still open! During coffee, I had to find a quiet corner to do an on-air interview with Chuck Roberts on CNN Headline News. I think it turned out pretty good. To watch it online, CLICK HERE. Back onboard, I met with various media including Candice Ludlow from Memphis National Public Radio affiliate WKNO. She produced a piece picked up on the national broadcast of All Things Considered. It is a lovely piece and can be listened to by CLICKING HERE. For our Memphis Tribute Event, we were honored to have Pete Avioti from the mayor’s office and Congressman Steve Cohen, supporter of the Delta Queen’s exemption extention bill. A nice crowd gathered down at the landing for the proceedings. Afterward, the Delta Queen departed for an evening dinner cruise. Captain Gabe Chengery played the calliope. It was hard to realize it was the boat’s final departure with passengers aboard. We headed downriver past the beautiful Memphis skyline and rounded the bend toward a symbolically perfect sunset. It was an agonizing and lovely evening. Laura and I had to really lock in our emotions to present the “Delta Queen: A Musical Journey” show we wrote for this special season. We celebrated the boat’s incredible life in story and shared some of the array of songs we have discovered written about her. Many stuck around late into the evening to enjoy more music and memories from Phyllis Dale and friends. There were many hugs, tears, and hopeful sentiments. It was a night I will always remember. Tomorrow these final passengers disembark. The American Queen will end her cruise here in Memphis and embark another group of guests. Together, the two will drift their way to New Orleans and into the pages of history.